This class provides a mechanism to generate multi-step web forms, similar to those used as the user interfaces for software installers. 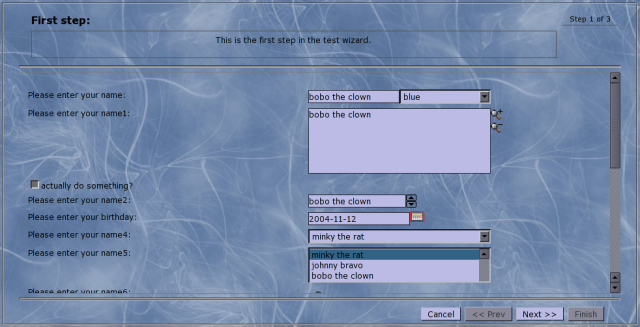 It is used by adding the input fields that should appear in each page of the steps of the wizard form and then generates the whole form in a single page with controls to interactively switch between the sets of inputs of each wizard step. Prize: One book of choice by O'Reilly Sometimes the sites need to ask their users to fill long forms. A common solution to make the form filling less confusing and tyring to the user, is to split the forms in multiple pages. This class provides a solution for presenting long forms in a way that they appear to show as multiple pages, but in reality it is just a single page form that has multiple sections with only one section visible to the user at each time.